There are so many great reasons to get creative with a bathroom project. A lot of time is spent in the bathroom, so it’s worth it to take a remodel beyond a functional space and turn it into a beautiful room that is enjoyable. Bathroom remodeling is easier, thanks to the low wholesale prices and professional advice from our team at ProSource® of Boston South. Our showroom has a wide selection of high-end bathroom sinks. 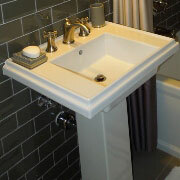 The sink can be a centerpiece to the bathroom design or a more functional element. Choose sinks by color, shape, type, material, drain location, or even by the number of faucet holes. 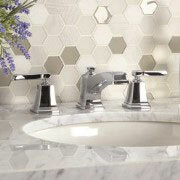 The experts at ProSource make it easy you to find the right bathroom faucet. There are different types of styles, materials, handle designs, and number of faucet holes to consider. Whether you want to keep things simple with a tub and shower combo with one stable shower head, or wants to mix it up entirely with multiple shower heads, faucets, and handles, ProSource helps you navigate the products to best meet function and design expectations. One of the most-used elements of the room, the bathroom vanity can transform a space. 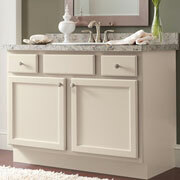 Vanities are full of storage spaces and functionality quirks that help make a small space manageable. Large bathrooms can also use vanities to create beautiful counter space, hold multiple sinks, and more. The bathtub is used by just about everyone in the family. Our experts can help you navigate through the options. 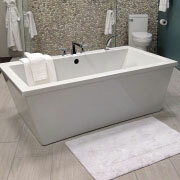 Do you want a freestanding tub, or a shower and tub combo? Do you want jets? These are just a few features of the tubs available at ProSource. The throne of the bathroom should not be chosen lightly. 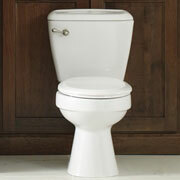 From eco-friendly flush models to toilets with unique flush handles, the toilet is one of the most-used pieces in the bathroom and should be chosen with care.